Pronounced a-ZAY-lee-a, this popular perennial shrub is a member of the Rhododendron family. However, unlike Rhododendrons that have clusters of blossoms, they feature only one bloom per stem. It is a fairly hardy plant, which is relatively easy to grow in most climates. Azaleas are native to China and Thailand, but they are now abundant in many parts of the world. Their natural habitat is in the dappled sunlight of a forest with moving trees that alternately provide them with bright sunlight and protective shade. By planting in a similar environment, growers will be rewarded with an abundance of blossoms in the spring. The optimum growing conditions for Azaleas are acidic, well-drained soil and moderate temperatures. 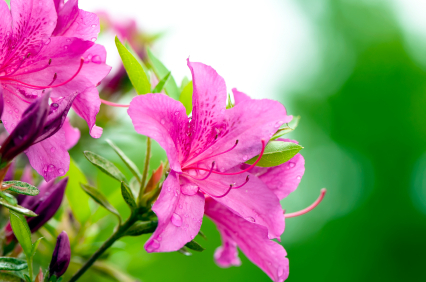 The best time to plant or transplant Azaleas is during early spring, just before they start to blossom. They are available to purchase throughout the year, although extra care should be taken during the winter months. The genus name for the Azalea is Rhododendron simsii. However, whilst they are related to Rhododendrons, they are not as hardy as the garden variety of this plant and should be kept indoors over the winter months. Azaleas are relatively easy to grow given the right soil conditions, but they do need plenty of water in order to thrive. If you live in a hard water area, it’s better to water with rainwater; otherwise the leaves may turn yellow. If the leaves go brown, they are not getting enough water. Although its name comes from the Greek word for “dry”, this actually refers only to the Lapland variety of Azaleas that will only grow in dry places and does not refer to the modern varieties we see today.